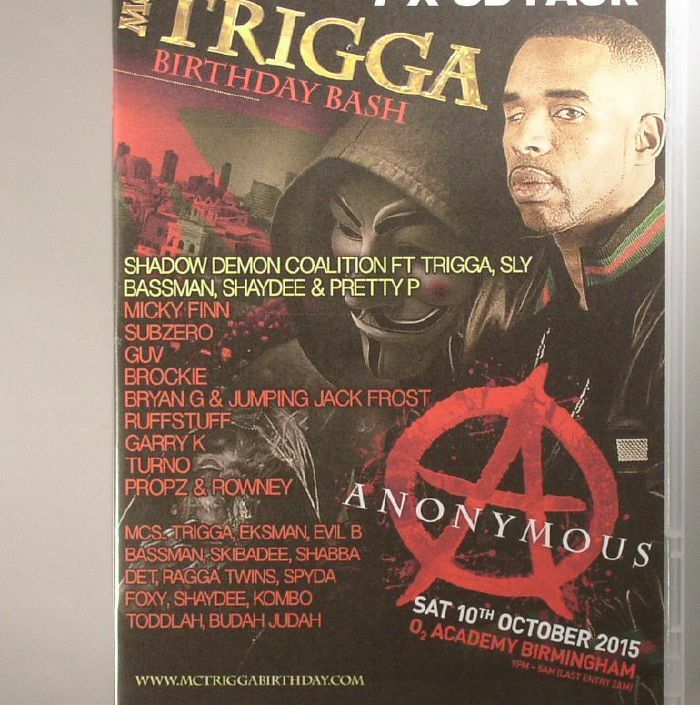 MC TRIGGA/VARIOUS MC Trigga s Birthday Bash 2015: Sat 10th October 2015 02 Academy Birmingham vinyl at Juno Records. 1. MC Trigga & Shadow Demon Coalition - "Track 1"
2. MC Trigga & Shadow Demon Coalition - "Track 2"
3. MC Trigga & Shadow Demon Coalition - "Track 3"
4. MC Trigga & Shadow Demon CoalitionMC Trigga & Shadow Demon Coalition - "Track 4"
5. MC Trigga & Shadow Demon Coalition - "Track 5"
6. MC Trigga & Shadow Demon Coalition - "Track 6"
7. MC Trigga & Shadow Demon Coalition - "Track 7"
8. MC Trigga & Shadow Demon Coalition - "Track 8"
9. MC Trigga & Shadow Demon Coalition - "Track 9"
10. MC Trigga & Shadow Demon Coalition - "Track 10"
11. MC Trigga & Shadow Demon Coalition - "Track 11"
12. MC Trigga & Shadow Demon Coalition - "Track 12"
13. MC Trigga & Shadow Demon Coalition - "Track 13"
14. MC Trigga & Shadow Demon Coalition - "Track 14"
15. MC Trigga & Shadow Demon Coalition - "Track 15"
16. MC Trigga & Shadow Demon Coalition - "Track 16"
17. MC Trigga & Shadow Demon Coalition - "Track 17"
18. MC Trigga & Shadow Demon Coalition - "Track 18"
19. MC Trigga & Shadow Demon Coalition - "Track 19"
20. MC Trigga & Shadow Demon Coalition - "Track 20"
21. MC Trigga & Shadow Demon Coalition - "Track 21"
22. MC Trigga & Shadow Demon Coalition - "Track 22"
23. MC Trigga & Shadow Demon Coalition - "Track 23"
24. MC Trigga & Shadow Demon Coalition - "Track 24"
25. MC Trigga & Shadow Demon Coalition - "Track 25"
26. MC Trigga & Shadow Demon Coalition - "Track 26"
27. MC Trigga & Shadow Demon Coalition - "Track 27"
1. Ruffstuff - "Track 28"
2. Ruffstuff - "Track 29"
3. Ruffstuff - "Track 30"
4. Ruffstuff - "Track 31"
5. Ruffstuff - "Track 32"
6. Ruffstuff - "Track 33"
7. Ruffstuff - "Track 34"
8. Ruffstuff - "Track 35"
9. Ruffstuff - "Track 36"
10. Ruffstuff - "Track 37"
11. Ruffstuff - "Track 38"
12. Ruffstuff - "Track 39"
1. Brockie/Props & Rowney - "Track 40"
2. Brockie/Props & Rowney - "Track 41"
3. Brockie/Props & Rowney - "Track 42"
4. Brockie/Props & Rowney - "Track 43"
5. Brockie/Props & Rowney - "Track 44"
6. Brockie/Props & Rowney - "Track 45"
7. Brockie/Props & Rowney - "Track 46"
8. Brockie/Props & Rowney - "Track 47"
9. Brockie/Props & Rowney - "Track 48"
10. Brockie/Props & Rowney - "Track 49"
11. Brockie/Props & Rowney - "Track 50"
12. Brockie/Props & Rowney - "Track 51"
13. Brockie/Props & Rowney - "Track 52"
14. Brockie/Props & Rowney - "Track 53"
15. Brockie/Props & Rowney - "Track 54"
16. Brockie/Props & Rowney - "Track 55"
17. Brockie/Props & Rowney - "Track 56"
18. Brockie/Props & Rowney - "Track 57"
19. Brockie/Props & Rowney - "Track 58"
20. Brockie/Props & Rowney - "Track 59"
21. Brockie/Props & Rowney - "Track 60"
22. Brockie/Props & Rowney - "Track 61"
23. Brockie/Props & Rowney - "Track 62"
24. Brockie/Props & Rowney - "Track 63"
25. Brockie/Props & Rowney - "Track 64"
26. Brockie/Props & Rowney - "Track 65"
1. Subzero - "Track 66"
2. Subzero - "Track 67"
3. Subzero - "Track 68"
4. Subzero - "Track 69"
5. Subzero - "Track 70"
6. Subzero - "Track 71"
7. Subzero - "Track 72"
8. Subzero - "Track 73"
9. Subzero - "Track 74"
10. Subzero - "Track 75"
11. Subzero - "Track 76"
12. Subzero - "Track 77"
13. Subzero - "Track 78"
14. Subzero - "Track 79"
15. Subzero - "Track 80"
16. Subzero - "Track 81"
17. Subzero - "Track 82"
18. Subzero - "Track 83"
19. Subzero - "Track 84"
20. Subzero - "Track 85"
21. Subzero - "Track 86"
22. Subzero - "Track 87"
1. Micky Finn - "Track 88"
2. Micky Finn - "Track 89"
3. Micky Finn - "Track 90"
4. Micky Finn - "Track 91"
5. Micky Finn - "Track 92"
6. Micky Finn - "Track 93"
7. Micky Finn - "Track 94"
8. Micky Finn - "Track 95"
9. Micky Finn - "Track 96"
10. Micky Finn - "Track 97"
11. Micky Finn - "Track 98"
12. Micky Finn - "Track 99"
13. Micky Finn - "Track 100"
14. Micky Finn - "Track 101"
15. Micky Finn - "Track 102"
1. Guv/Garry K - "Track 103"
2. Guv/Garry K - "Track 104"
3. Guv/Garry K - "Track 105"
4. Guv/Garry K - "Track 106"
5. Guv/Garry K - "Track 107"
6. Guv/Garry K - "Track 108"
7. Guv/Garry K - "Track 109"
8. Guv/Garry K - "Track 110"
9. Guv/Garry K - "Track 111"
10. Guv/Garry K - "Track 112"
11. Guv/Garry K - "Track 113"
12. Guv/Garry K - "Track 114"
13. Guv/Garry K - "Track 115"
14. Guv/Garry K - "Track 116"
15. Guv/Garry K - "Track 117"
16. Guv/Garry K - "Track 118"
17. Guv/Garry K - "Track 119"
18. Guv/Garry K - "Track 120"
19. Guv/Garry K - "Track 121"
20. Guv/Garry K - "Track 122"
21. Guv/Garry K - "Track 123"
22. Guv/Garry K - "Track 124"
23. Guv/Garry K - "Track 125"
24. Guv/Garry K - "Track 126"
25. Guv/Garry K - "Track 127"
1. Bryan Gee & Jack Frost/Turno - "Track 128"
2. Bryan Gee & Jack Frost/Turno - "Track 129"
3. Bryan Gee & Jack Frost/Turno - "Track 130"
4. Bryan Gee & Jack Frost/Turno - "Track 131"
5. Bryan Gee & Jack Frost/Turno - "Track 132"
6. Bryan Gee & Jack Frost/Turno - "Track 133"
7. Bryan Gee & Jack Frost/Turno - "Track 134"
8. Bryan Gee & Jack Frost/Turno - "Track 135"
9. Bryan Gee & Jack Frost/Turno - "Track 136"
10. Bryan Gee & Jack Frost/Turno - "Track 137"
11. Bryan Gee & Jack Frost/Turno - "Track 138"
12. Bryan Gee & Jack Frost/Turno - "Track 139"
13. Bryan Gee & Jack Frost/Turno - "Track 140"
14. Bryan Gee & Jack Frost/Turno - "Track 141"
15. Bryan Gee & Jack Frost/Turno - "Track 142"
16. Bryan Gee & Jack Frost/Turno - "Track 143"
17. Bryan Gee & Jack Frost/Turno - "Track 144"
18. Bryan Gee & Jack Frost/Turno - "Track 145"
19. Bryan Gee & Jack Frost/Turno - "Track 146"
20. Bryan Gee & Jack Frost/Turno - "Track 147"
21. Bryan Gee & Jack Frost/Turno - "Track 148"
22. Bryan Gee & Jack Frost/Turno - "Track 149"
23. Bryan Gee & Jack Frost/Turno - "Track 150"
24. Bryan Gee & Jack Frost/Turno - "Track 151"
25. Bryan Gee & Jack Frost/Turno - "Track 152"